Today, Finnish-brand Marimekko celebrates its 50th anniversary of their stylish, iconic poppy pattern officially known as Unikko. The revolutionary floral textile has made its way on to countless mediums throughout its lifetime and in honor of the sensational design we've gathered some of our favorite past articles as well as current offerings from the Dwell Store. 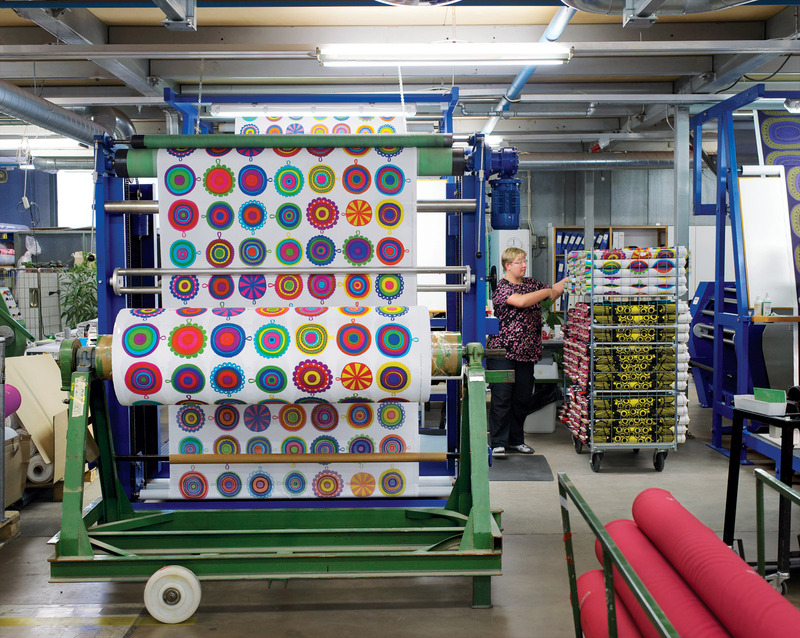 Step inside Marimekko’s printing factory for a look at how its iconic textiles come to life. Photo by Alex Subrizi. The Mini Unikko and the Pieni-Unikko Smartbags feature Maija Isola’s bold, mod flower prints that made Marimekko a household name. Made from durable and resilient polyester, the Smartbag folds down to a portable square— perfect for stashing in purses and briefcases— then expands to a generous tote for when a little extra storage is needed. A sophisticated foul-weather staple, the Pieni Unikko Stick Umbrella keeps you stylish and dry. Crafted from the classic Marimekko Unikko poppy pattern print, this chic umbrella has a red wooden handle and manual open and close features for a protective cover when you need it. Ideal for parties and large gatherings, Marimekko’s Siirtolapuutarha Round Tray is made for events. The oversized tray can accommodate hors d’oeuvres or main dishes with ease while the cheerful pattern from designer Maija Louekari pays homage to nature with a vibrant blue flower pattern. Because the pattern is taken directly from Marimekko fabric, some wrinkles in the fabric may be present. Designed by Sami Ruotsalainen for Marimekko, the Oiva Serving Pot’s minimal shape is understated and elegant. Made from clean white porcelain with a natural wood handle and accent, the Serving Pot brings modern warmth to any table. Mix with other pieces from the Oiva collection for a rich and alluring table-setting. Dishwasher, freezer, and microwave safe. Featuring a graphic print designed by Aino-Maija Metsola for Marimekko, this Oiva Bowl has a small silhouette with a distinctive pattern. A part of Marimekko’s Weather Diary Collection, the print is inspired by the changing natural landscapes in Finland. This print, which is characterized by bold black lines, resembles tall grass, and Mestola’s sketch-like approach to the design provides movement to the print, calling to mind a crisp breeze. The Oiva Bowl is made from durable yet delicately glazed porcelain, and can be used alongside other pieces in the Weather Diary Collection to create a graphic tabletop statement. Photo by Alex Subrizi. Image courtesy of 2011.